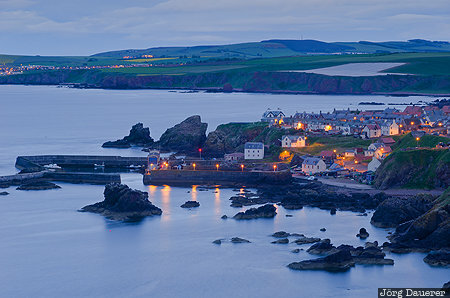 The small fishing village St Abbs and the rocky coast surrounding it at the blue hour after sunset. St Abbs is in Berwickshire in the south west of Scotland in the north of the United Kingdom. This photo was taken in the evening of a cloudy day in June of 2013. This photo was taken with a digital camera.